LAST REG-SEA GAME 12/4/11: Lions 17 at Saints 31. New Orleans QB Drew Brees completes 26 of 36 passes for 342 yards & 3 TDs. Saints WR Robert Meachem has 119 receiving yards, including 67-yard TD. LAST GAME AT SITE 12/21/08: Saints 42, Lions 7. New Orleans offense totals 181 rushing yards & 4 rush TDs. Saints WR Marques Colston catches 9 passes for 99 yards & 2 TDs. BROADCAST FOX (1:00 PM ET): Chris Myers, Ronde Barber, Jennifer Hale (Field reporter). SIRIUS: 112 (NO), 135 (Det.). XM: 229 (Det.). SAINTS: QB DREW BREES is 4-0 vs. Det. (incl. playoffs), completing 115 of 153 (75.2 pct.) for 1,517 yards with 14 TDs vs. 1 INT for 133.8 rating. In 9/13/09 meeting, passed for 358 yards & 6 TDs. Since joining NO in 2006, leads NFL with 40,307 pass yards & 292 TD passes…RB PIERRE THOMAS had 112 scrimmage yards (77 rec., 35 rush) & 2 TDs (1 rush, 1 rec.) in Week 5. In WC meeting, had 121 scrimmage yards (66 rush, 55 rec.) & TD. RB MARK INGRAM had 14-yard TD run in last meeting…TE JIMMY GRAHAM had TD catch in WC meeting. Since 2011, leads NFL TEs with 304 catches, 3,883 yards & 39 TDs. WR MARQUES COLSTON had 7 catches for 120 yards in WC game vs. Det. In only game at Det., had 9 catches for 99 yards & 2 TDs. Incl. 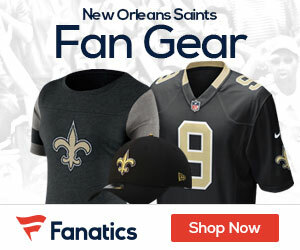 playoffs, WR ROBERT MEACHEM aims for 4th in row vs. Det. with TD & 3rd meeting in row with 100+ yards. WR BRANDIN COOKS leads NFL rookies with 32 catches…LB JUNIOR GALETTE had sack & safety in Week 5. Had sack in last meeting. LB CURTIS LOFTON had 10 tackles in his last game at Det. (10/23/11 with Atl.). DE CAMERON JORDAN has 13.5 sacks in past 20…LIONS: QB MATTHEW STAFFORD has 788 pass yards (394 per game) in past 2 meetings (incl. WC). Since 2011, ranks 2nd in NFL with 16,247 pass yards…RB REGGIE BUSH was No. 2 pick by NO in 2006. Played 5 years in NO (2006-10) & had 33 TDs (17 rush, 12 rec., 4 PR). RBs JOIQUE BELL (rush) & THEO RIDDICK (rec.) each had TD last week…In WC meeting, WR CALVIN JOHNSON had 12 catches for 211 yards & 2 TDs. In past 16 at home, has 109 catches for 1,926 yards (120.4 per game) & 10 TDs. Since 2011, leads NFL with 5,485 rec. yards & 107.5 rec. yards per game. WR GOLDEN TATE leads team in rec. (38) & rec. yards (495)…Total defense (270.7) & pass defense (197.2) lead NFL. Rush defense (73.5) ranks 2nd. LB DE ANDRE LEVY leads team with 58 tackles. Has 7 INTs since 2013, most by LB. LB TAHIR WHITEHEAD had career-high 2 INTs last week. Lions had 8 sacks last week, incl. 2.5 by DE EZEKIEL ANSAH & 2 by DT NDAMUKONG SUH.